The space of two neighboring rooms with fusuma in between is the most effectively utilized in this section. Here, the son listened to his father’s decision without any utterance of protest, but his despair and disappointment is apparent visually. The next room has been a void up until this point, then the son moves to the room and sits on tatami quietly, his back toward his father. The distance here is only a few meters in reality, but we feel it more distant than it actually is. This “parent-child” conflict is always a recurring theme of Ozu films. But the treatment of the conflict in this film is quite unique. For example, the similar space of two rooms plus upstairs is the stage for such a conflict in “Late Spring”. There are two rooms separated by fusuma at the lower level, one of which is the father’s room and the other is a sort of living room. The upstairs is the Noriko’s room. When Noriko comes home from Noh theater incident and subsequent visit to her friend, she was not in the mood to speak to her father. She barely acknowledges him and goes upstairs to her privacy. Then she goes downstairs to pour out her problem, which her father receives rather coolly. During this conversation, Noriko is sitting on the border of this two-room unit, not to trespass into his father’s space. She goes upstairs, quite agitated and upset, then her father actually follows her into the room to try to reason with her. This whole passage is quite significant in the treatment of the “personal” space. Noriko is not going to cross over to his father’s space, while her father does. In another words, ultimately, the parent’s life is not of her concern, for better or worse, while her life is very much of the father’s concern. However, in “Late Spring”, the conflict occured at their home, where each has his/her place of own. In “There Was A Father”, the conflict is played out at the “public” space, “Ryotei”, a sort of Japanese restaurant. This is probably upstairs of a Ryotei, where you can reserve “Zashiki”, a set of rooms for your group. Because neither the father nor the son has no place of his own in this space, the conflict is not consumed but suppressed instead. The son is not allowed to express his anguish or frustration, while the father tries to reason with him. This is a striking contrast to the scene in the “I Was Born But…”, in which the sons really go berserk against their father and the father rather tersely gives them spanking. In this film, the moral framework is so rigid that the son will never “talk back” to his father even if it means his affection. The use of “public” space further emphasizes this moral framework eliminating private spaces for emotional exchange. The scene ends with the sad, sunken face of the child, then the story jumps forward to almost ten years later. We learn the son is now accepted to the University located in Sendai. Here, the father says he expected his son to come to Tokyo but it did not realize. To understand this remark, it would be helpful to review the system of higher learning in the prewar Japan. Before the war, there were eight universities (“Higher Schools”) funded by the federal government. They are numbered, starting “The First Higher School” in Tokyo. The Second in Sendai, the Third in Kyoto, and the Fourth in Kanazawa so on. The students in these numbered schools were the elites in the society, with the brightest future ahead. Above all, The First Higher School in Tokyo was considered the best, with alumini of many powerful figures in politics, industry and military. Here, the father was expecting his son to be admitted into the First Higher School in Tokyo, but the son entered the Second in Sendai instead, suggesting that the son was slightly short of the father’s expectations. In many of Ozu’s films, the parents are slightly disillusioned by what their children has achieved. 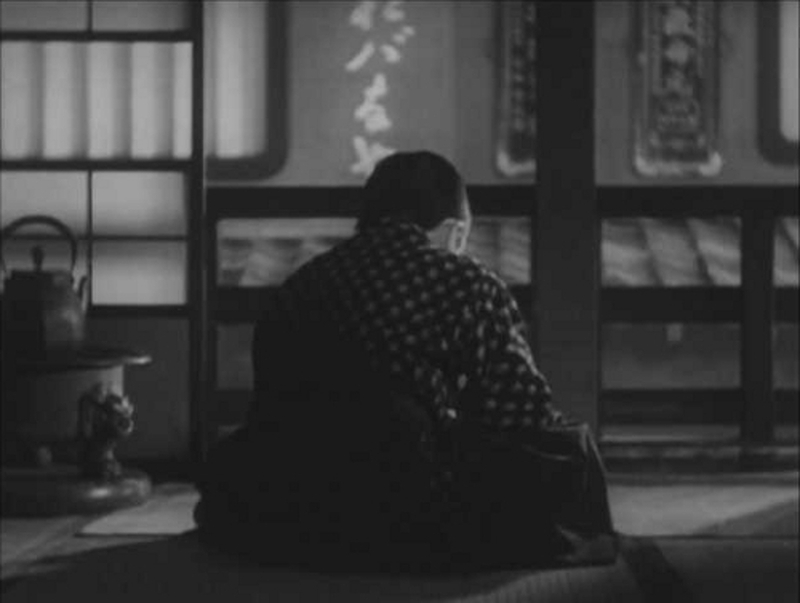 In “Tokyo Story”, the son, a doctor, is not as successful as the father imagined. In “Only Son”, the mother finds her son being a night school teacher, married with children. At the same time, their children are also disappointed by the parents, as in “I Was Born But …”. The father is working in the textile factory, one of the most successful industries in 1930s Japan (though crippled by Depression somewhat, it was the leading industry at the time). It is interesting to note that the father wears the brighter clothes while up until this point, his clothes were mainly dark. Then another jump to five years later. We find the father working in the office (here, he wears the darker suits again).